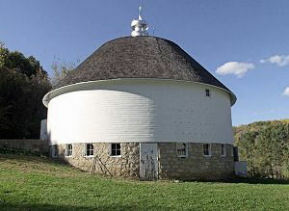 Red Wing Minnesota's Round Barn Farm Bed and Breakfast. Region: Goodhue County, one hour from Minneapolis-St Paul, Rochester, MN, and Eau Claire, WI. Red Wing, Minnesota historic lodging offers 5 suites with a fireplace and jacuzzi. Includes three-course breakfast featuring home made bread. Enjoy shopping and outdoor activities nearby. The bed and breakfast is a delight. Built on a design from 1861 by architect Samuel Sloan, the use of reclaimed timbers and country antique furnishings combine to deliver the atmosphere, comforts, and charms of days gone by. On the National Register of Historic Buildings, the lodging is truly a fascinating and beautiful example of architecture. Built in 1914 by Henry and Mary Dammon to accommodate dairy cattle, and subsequently used as a honey-processing facility by Earl and Retha Griffith, the barn has been renovated as a special place for weddings, receptions, dances, parties, and reunions. 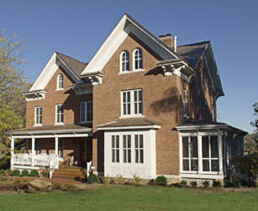 This and other MN Bed and Breakfast Inns can be found here online in The Register.